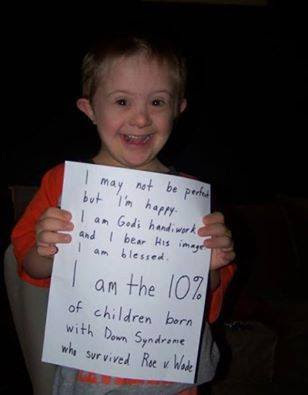 This happy child conveys the inconvenient truth that nine out of ten mothers abort their unborn children when they learn that they pregnant with a Down Syndrome fetus. This is despite research which gives hope to "chromosome therapy" to silence the extra chromosome in Down Syndrome patients. Lifenews carried a story which many mothers maintain that they terminated the pregnancy not because they wanted a "perfect child", but because the world is a hard place for a person with intellectual disabilities. So this is a protective killing, so that the nascent child is not harmed in the future? In the United Kingdom, there is a non-invasive Ariosa Harmony test which claims a 99% accuracy for predicting Down Syndrome for single babies and 98% for twins with a simple blood test. The fear is that the National Health Service would use the Ariosa Harmony information to pressure even more mothers to end their Downs Syndrome pregnancy. This pressure from society and government to avoid the expense and exasperation of having a Down Syndrome child should not be dismissed as something from afar. In the Affordable Care Act (a.k.a. Obamacare) HHS Qualified Health Plan provisions which allow for "free" abortifacients. Moreover, the IPAB (a.k.a Death Panels) may decide that treatments associated with dealing with Down Syndrome people are no longer covered.